So right now you may be thinking "what the heck's a blog blitz?". Well, it's an opportunity for you, my dear reader, to get the low down on a specific designer and read honest reviews of a featured kit from said designer. The reviews are written by people just like you & me. In other words, real people, with real experiences and REAL opinions. Are you with me so far? Now, I'll be honest (after all that's what this post is all about right? ), my first reaction when I saw the kit preview was "oh, I'm not sure about the those masks!". But actually, once I'd downloaded the kit, those masks became the key element I definitely wanted to include in my page. I was seriously delighted with the paper choices in this kit. There's a great selection of plain papers (8 in total), all of which have a really nice subtle texture to them. There's also a funky collection of vibrant patterned papers (15 in total), each of which has a plain paper to compliment it. I've got to say that I was a little disappointed by the relatively small selection of elements in the kit (11 in total). Having said that, what there was, were of good quality, great colour and the splendor and pizazz of those masks made up for what I initially felt was missing in terms of elements quantity. It's worth noting that you also get a full set of very sparkly alphas in the kit, which is great for titles or adding a bit bling to your page! None of the elements are pre-shadowed, which is useful if you're an experienced digi-scrapper as it means you have total control over such matters, but I can imagine some newer digi-scrappers may find the elements looking a bit flat and kind of lost on their page (kwim?) because of the lack of shadow. 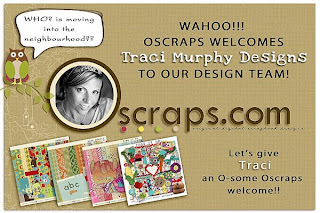 Do you want to hear some EXCITING news about Traci??? 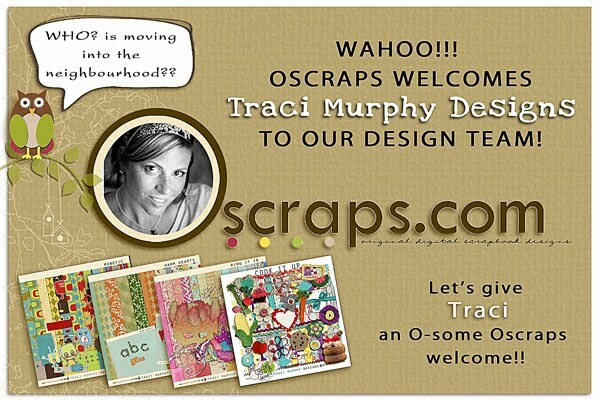 Well, she's been dipping her toes in the water at Oscraps for a couple of months now, but I'm thrilled to say she's decided to take the plunge and make the "O" her hOme. Woo-hoo! 2.) 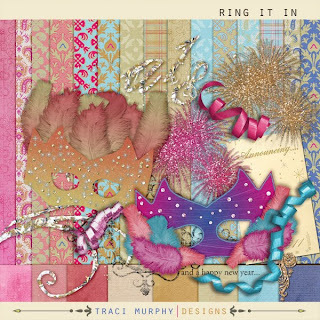 Go to the Traci's designer gallery http://bit.ly/TraciMurphy-gallery and start leaving some love on the wonderful layouts there! 3.) 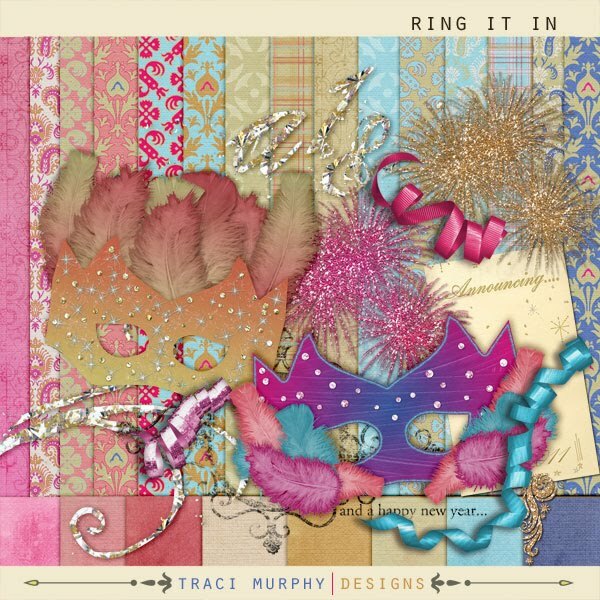 After every comment - copy the link to that layout and paste it back in this thread - http://bit.ly/TraciMurphy-welcome - by editing your original post! (each post should hold approximately 100 links before you need to create a new post to continue your list.) Please do not create a new post for each link. We ask that you don't just copy & paste or leave one word comments (such as "beautiful", "gorgeous", "lovely" etc). We want to make sure that each layout receives genuine comments and love. Hope you understand where we're coming from! Thanks for stopping by today ... I hope you'll come and visit again soon! 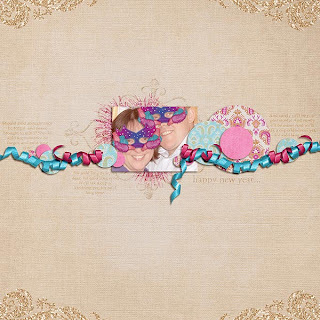 Love the way you used the masks! and positioned the glitter! And we are so happy the O is her digi home...aren't we?? I am loving her. And now I'm glad to have visited your blog.